There are 6 different ferry operators to choose from, with up to 19 departures a day from Koh Samui to Koh Phangan. You can book ferry tickets from Koh Samui to Koh Phangan online use the Search Box below. Fast Boasts: 2 ferry operators provide fast services scheduled to take 30 minutes or less. Slower Boats: The other 4 ferry operators use slower boats taking from 45 minutes to 2 hours. * The Thong Nai Express only runs January to September in good weather. Seatran Discovery from Bangrak Pier. Lomprayah Ferry from Maenam Pier. Lomprayah ferry from Nathon Pier. Use the Search Box below to book your ferry tickets from Koh Samui to Koh Phangan. Ticket prices are the same as at the ferry pier. Ticket confirmation is instant and you will be sent an E-Ticket after booking. Songerm boat from Nathon Pier to Thong Sala pier. Thong Nai Pan Express boat from Maenam beach to Thong Nai Pan beach. Raja ferry from Lipa Noi pier to Thong Sala pier. Haad Rin Queen from Big Buddha pier to Haad Rin. The Haad Queen and Thong Nai Pan Express cannot be booked in advance, and for the Raja ferry and Songserm it is not normally necessary to book in advance. Seatran Discovery ferries depart from Bangrak Pier, which is near Koh Samui airport and 7 minutes drive from Fisherman’s Village in Bophut. You can get to Bangrak pier easily from the airport in a shared minivan. There are also shared pick up truck taxis which ply the routes from Chaweng to Bangrak and from Bophut to Bangrak. Maenam Lomprayah Pier is on the North of the island about 15 minutes drive from Nathon and 25 minutes drive from Chaweng. Shared taxis frequently run along the main road past the turning to the Maenam Lomprayah Pier. From the main road to the pier it is a walk of around 1.5 km. You may want to take a taxi if you have luggage to carry. All ferry services (with the exception of the Haad Rin Queen and Thong Nai Pan Express) terminate at in Thong Sala. There are two piers close together in Thong Sala, Koh Phangan Ferry Port is the arrival point for Raja Ferry, Seatran Discovery and Lomprayah ferries. Songserm ferries arrive at a different pier a short distance away. From the main ferry pier in Thong Sala there are plenty of shared or private taxis to all points on the island. 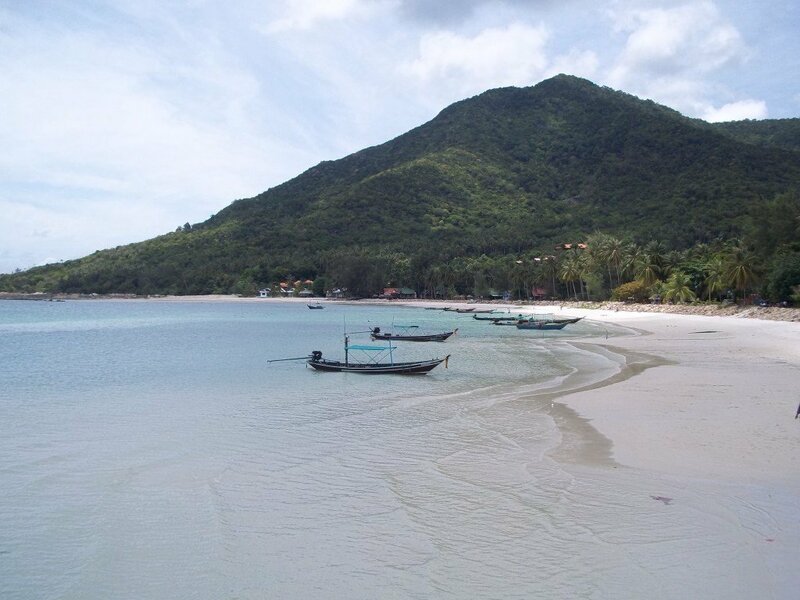 If you are going to one of the more popular destinations, such as Haad Rin, Thong Nai Pan or Haad Yao then you are likely to able to join other people in a taxi and travel for around 200 to 300 THB per person depending on your final destination on the island. If you are going somewhere less popular then you need either to wait for other people going the same way to turn up or pay more money to hire the whole taxi.